Most charters operate from Saturday to Saturday. I would try to arrive in Greece at least the day before if possible. This is especially true for a cabin charter that may not wait for you. If you are chartering a bareboat there is a little more leeway and it will wait for you if you are delayed. If you charter a yacht other than Saturday-Saturday there is a good chance they will charge you two weeks since you will be taking the yacht out of commission for a period spanning two "charter" weeks. Charter a bareboat yacht for at least 1 week and return the yacht to the port you picked it up at. If you charter it for less than a week, they usually charge you for a full week which makes the per day rate higher. If you return it to another port there are one-way charges that can be particularly high. Bareboat charters normally start at 5pm on Saturday and end at 9am on the following Saturday. Yacht companies will try to accommodate you and let you leave early if they can, but they have to get the boat ready for you. If they agree to let you have it early, it is possible that something will go wrong on the charter before you and they may not be able to honor that request. Getting a particular skipper for a bareboat charter has it's pitfalls. If you are going to Greece try to organize your flights and yacht charter so that they are coordinated. If you go to Greece for 10 days and aren't there for 2 Saturdays you could run into a problem with getting the yacht for a full week at the lowest rate. Airline tickets have become more expensive so the best way to organize your trip is to make the reservations for your flight, get confirmation on a charter and purchase both. Charter contracts should be signed and returned within 2 weeks to ensure that your space is reserved. 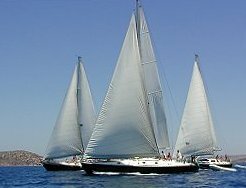 If you charter a bareboat you will have to pay for fuel(figure 2-5 gallons per day), water(5-10 euros to fill the tank), dockage(3-5 euro at the government docks if the dockmaster comes to collect), end cleaning and your food and supplies for the yacht. Cabin charters will cover most of these costs, but you'll have to check on the individual charter to see which meals and drinks are covered. For Bareboats with skippers and owner/skipper. Don't take too much time working out an intricate itinerary. 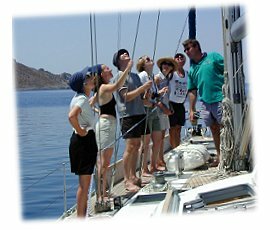 Your skipper will be an expert on Greece and will have many great ideas for places to visit. Discuss the options with your skipper, take into account the weather and then make the decision. I tell people to have a rough outline of things they would like to do, but keep the "must do" at a minimum(or nonexistent). The truth there is nothing you will see or that you might not see that will determine the success or failure of your trip. When choosing a charter, although the itinerary is important, all the itineraries are very interesting, but in different ways. The larger cabin charters can cover a lot of ground and will show you a lot of different things in a relatively short time. The smaller boats travel at a slower rate and but you will see places in more depth.